This breed is an ancient breed. 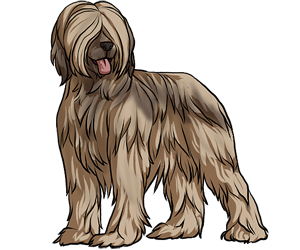 The Briard has been around for several centuries. They were drawn on Tapestries in the 8th century and mentioned in records during the 12th century. In the Middle Ages, they were in France. They were used to defend their owner against wolves and poachers. However, after the French Revolution, they had easier tasks such as herding flocks and guarding property. The documentation on how they came to America is hazy. Some say Marquis de Lafayette brought them over. Others say Thomas Jefferson was the first to bring the dogs over to North America. Thomas Jefferson held an interest in the breed. He started the first breeding program in America. Charlemagne and Napoleon are believed to have owned a Briard. Nicknamed "A Heart of Gold Wrapped in Fur"
Is still used as a herding dog today.